Liverpool made an unconvincing start to life without Luis Suarez - but goals from Raheem Sterling and Daniel Sturridge edged them past a Southampton side who shone despite their summer upheaval. Although the £75m sale of Suarez to Barcelona stripped the Reds of one of the game's most prolific strikers, Sterling and Sturridge struck either side of a Nathaniel Clyne equaliser to compensate on this occasion. But Liverpool were left hanging on for the win and will have to improve significantly if they are to repeat or improve on their second-place finish last season. A new-look Southampton, under new manager Ronald Koeman , were the more dangerous team for long periods and might have claimed a deserved point when Morgan Schneiderlin fired against the bar late on. Following a turbulent few months in which the south coast club lost their manager and a host of key players, this display suggests reports of their demise could be premature. The irony of the fixture was that three of those players - Rickie Lambert, Adam Lallana and Dejan Lovren - moved to Anfield as part of a post-Suarez rebuilding job that has seen Liverpool spend more than £100m, with the transfer window still open for another two weeks. Lovren was the only member of that trio to start against his former employers as Lambert took a place on the bench and Lallana missed out with a knee injury - and the Croat made an instant impression. While much focus has been placed on how Liverpool will cope without Suarez, who scored 31 league goals in 2013-14, only Manchester City (102) and Chelsea (71) managed more than their 70 when the Uruguayan's strikes are subtracted. Perhaps of more pressing concern, therefore, was the 50 goals they conceded; 13 more than City and 23 more than Chelsea. Lovren's display suggested he may well provide the solution. He was towering alongside Martin Skrtel at centre-back as Southampton threatened in the early stages, providing a solid platform from which his team were able to build. Dusan Tadic has provided three assists in his last three league games (two for FC Twente, one for Southampton). On top of Lambert, Lallana and Lovren, Saints also saw Luke Shaw depart for Manchester United, Calum Chambers for Arsenal and boss Mauricio Pochettino for Tottenham. But the exits generated almost £100m and about half of that has been reinvested to give Koeman a chance of continuing his predecessor's encouraging work. Goalkeeper Fraser Forster, left-back Ryan Bertrand, playmaker Dusan Tadic and striker Graziano Pelle all slotted in fairly seamlessly for Saints, while Schneiderlin excelled despite his well-documented desire to leave for Tottenham. The visitors had played the more fluent football before Henderson robbed Tadic of possession, beat Schneiderlin and sent Sterling clean through with a magnificent curling pass that split the opposition centre-backs. Sterling kept calm to slot past Forster. Southampton could easily have fallen apart, but they responded positively as James Ward-Prowse and Schneiderlin both forced Simon Mignolet to tip efforts from distance over the bar. The pattern of play continued after half-time and Koeman's men were rewarded when right-back Clyne found Tadic on the edge of the box, continued his run untracked and collected a sublime back-heel to lash high past Mignolet. 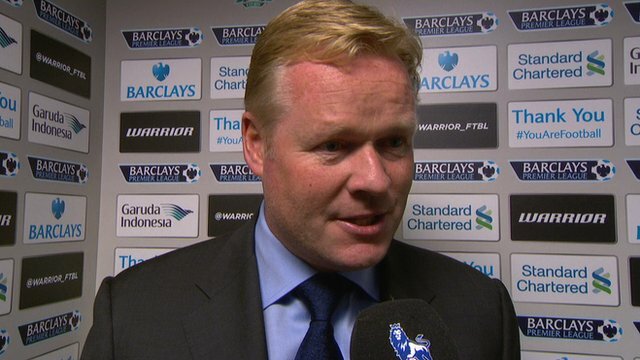 "They may have lost, but if I were a Saints fan I'd be hugely encouraged by that performance. Despite a summer of madness, they'll be fine." Steven Davis wasted a glorious chance to put the visitors ahead and their pressure mounted, drawing groans of frustration from the home supporters. Liverpool boss Brendan Rodgers introduced former Saint Lambert to add some physical presence to the Liverpool attack, while Koeman turned to £12m acquisition Shane Long. Southampton seemed the more likely scorers but lacked a cutting edge up front and were punished when they failed to clear a cross and Sterling found Sturridge to touch home the winner. There was still time for Mignolet to touch Schneiderlin's drive onto the woodwork, Long heading the rebound wide, but Liverpool dug in to open their Premier League bid with three points. 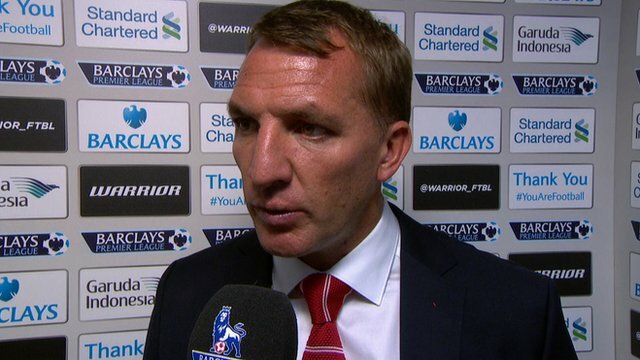 "I think we played a great second half, after 1-1 I think there was one team on the pitch playing and it was Southampton. "We had a chance to score the second one, two great opportunities but the quality of Liverpool, they don't need many opportunities to score and that makes the difference. "The way we played I think brings us a lot of confidence." You can find lots more pictures from Sunday's Premier League games on the BBC Sport Facebook page. Full Time Match ends, Liverpool 2, Southampton 1. Full Time Second Half ends, Liverpool 2, Southampton 1. Attempt missed. Shane Long (Southampton) header from very close range is close, but misses to the right. Attempt saved. Morgan Schneiderlin (Southampton) left footed shot from the centre of the box is saved in the top centre of the goal. Assisted by Graziano Pellè. Dangerous play by Joe Allen (Liverpool). Lloyd Isgrove (Southampton) wins a free kick in the defensive half. Attempt saved. James Ward-Prowse (Southampton) right footed shot from the left side of the box is saved in the bottom left corner. Assisted by Graziano Pellè. Substitution Substitution, Southampton. Lloyd Isgrove replaces Steven Davis. Goal! Goal! Liverpool 2, Southampton 1. 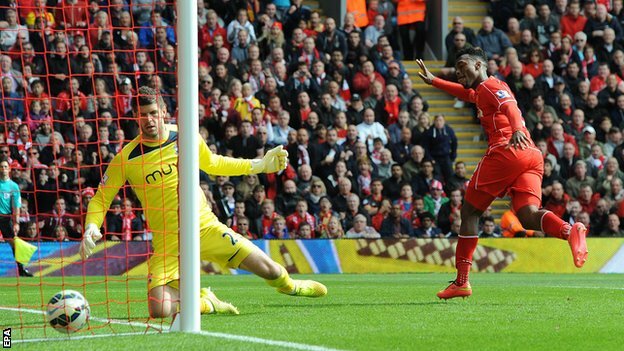 Daniel Sturridge (Liverpool) left footed shot from very close range to the bottom left corner. Assisted by Raheem Sterling with a headed pass. Booking Steven Davis (Southampton) is shown the yellow card. Joe Allen (Liverpool) wins a free kick in the attacking half. Attempt blocked. Daniel Sturridge (Liverpool) left footed shot from outside the box is blocked. Assisted by Raheem Sterling. Substitution Substitution, Liverpool. Rickie Lambert replaces Philippe Coutinho. Attempt missed. Jordan Henderson (Liverpool) right footed shot from outside the box misses to the left. Assisted by Joe Allen. Substitution Substitution, Southampton. Shane Long replaces Dusan Tadic. Offside, Liverpool. Raheem Sterling tries a through ball, but Daniel Sturridge is caught offside. Attempt blocked. Graziano Pellè (Southampton) right footed shot from the centre of the box is blocked. Assisted by Nathaniel Clyne. Attempt blocked. James Ward-Prowse (Southampton) right footed shot from outside the box is blocked. Assisted by Jose Fonte with a headed pass. Booking Morgan Schneiderlin (Southampton) is shown the yellow card for a bad foul. Substitution Substitution, Liverpool. Joe Allen replaces Lucas Leiva. Attempt saved. Steven Davis (Southampton) right footed shot from the centre of the box is saved in the centre of the goal. Assisted by James Ward-Prowse. Graziano Pellè (Southampton) wins a free kick in the defensive half. Attempt missed. Steven Davis (Southampton) right footed shot from the right side of the box is high and wide to the right following a corner. Corner, Southampton. Conceded by Javier Manquillo. Goal! Goal! Liverpool 1, Southampton 1. Nathaniel Clyne (Southampton) right footed shot from the centre of the box to the top right corner. Assisted by Dusan Tadic. Attempt missed. Victor Wanyama (Southampton) right footed shot from outside the box misses to the right. Assisted by Steven Davis. Attempt missed. Raheem Sterling (Liverpool) right footed shot from outside the box is too high. Assisted by Philippe Coutinho. Corner, Southampton. Conceded by Jordan Henderson. Second Half begins Liverpool 1, Southampton 0. Half Time First Half ends, Liverpool 1, Southampton 0. Offside, Liverpool. Raheem Sterling tries a through ball, but Philippe Coutinho is caught offside. Attempt saved. Raheem Sterling (Liverpool) right footed shot from outside the box is saved in the top centre of the goal. Assisted by Jordan Henderson. Corner, Southampton. Conceded by Simon Mignolet. Attempt saved. Morgan Schneiderlin (Southampton) right footed shot from outside the box is saved in the top centre of the goal. Offside, Southampton. Fraser Forster tries a through ball, but Dusan Tadic is caught offside. Corner, Southampton. Conceded by Lucas Leiva. Attempt saved. James Ward-Prowse (Southampton) right footed shot from outside the box is saved in the bottom left corner. Assisted by Jose Fonte. Javier Manquillo (Liverpool) wins a free kick in the defensive half. Booking Javier Manquillo (Liverpool) is shown the yellow card for a bad foul. Foul by Javier Manquillo (Liverpool). Delay in match Victor Wanyama (Southampton) because of an injury. Attempt missed. Glen Johnson (Liverpool) right footed shot from outside the box is too high following a corner. Corner, Liverpool. Conceded by Nathaniel Clyne. Attempt missed. Graziano Pellè (Southampton) right footed shot from the left side of the six yard box is high and wide to the left. Assisted by Morgan Schneiderlin with a cross. Goal! Goal! Liverpool 1, Southampton 0. Raheem Sterling (Liverpool) right footed shot from the centre of the box to the bottom right corner. Assisted by Jordan Henderson with a through ball. Attempt saved. Raheem Sterling (Liverpool) left footed shot from the left side of the box is saved in the bottom left corner. Assisted by Philippe Coutinho. Javier Manquillo (Liverpool) wins a free kick on the right wing. Attempt missed. Glen Johnson (Liverpool) left footed shot from outside the box is high and wide to the left. Assisted by Lucas Leiva. Offside, Southampton. Ryan Bertrand tries a through ball, but Dusan Tadic is caught offside. Attempt saved. Lucas Leiva (Liverpool) left footed shot from very close range is saved in the centre of the goal. Assisted by Martin Skrtel with a headed pass. Corner, Liverpool. Conceded by Jose Fonte. Jordan Henderson (Liverpool) wins a free kick in the attacking half. Attempt missed. Daniel Sturridge (Liverpool) left footed shot from outside the box is close, but misses the top left corner. Victor Wanyama (Southampton) wins a free kick in the defensive half. Javier Manquillo (Liverpool) wins a free kick in the attacking half.